Being part of a global network of schools means that GEMS World Academy Chicago can provide access to co-learning experiences with peers at sibling schools overseas. In this blog post, Director of Innovation Peg Keiner writes about her recent "innovation exchange" with teachers and students at GEMS World Academy Switzerland. In a future post, we'll look at the experiences that two GEMS Chicago families had this year at GEMS World Academy Singapore. One of the core values of GEMS schools is leading through innovation, and the week I spent at GWA Switzerland was a powerful example of the power of that idea. During my visit, I had the opportunity to meet with every GWA Switzerland teacher in the International Baccalaureate Primary Years Program — from the early-years classes to fifth grade — as well as teachers from the Science, Humanities, Library, and Film Department. During a Professional Development day, I taught two carousel sessions; one focused on Google Earth and National Geographic Education resources, the other on Flipgrid and Clips. I also spent time in the classrooms, where I worked with students in kindergarten and grades 2, 4, 5, 6 and 10. 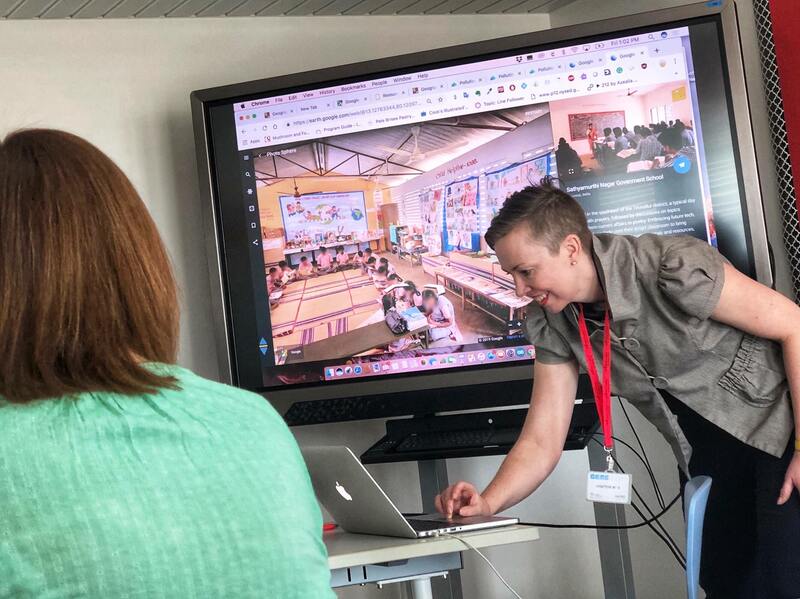 I collaborated with the GWA Switzerland teachers on lessons that used a variety of immersive media to engage students in their units of inquiry through storytelling. 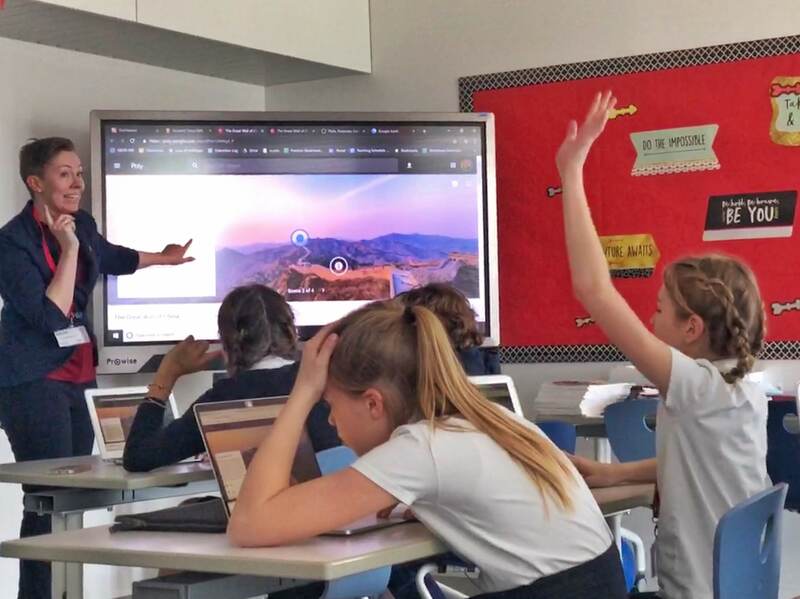 In grade 4, Keri-Lee Beasley from GWA Switzerland and I were able to co-teach lessons together, helping students develop skills with resources like Google Earth, National Geographic and Keynote. Ms. Beasley spent a week here in Chicago earlier this school year. It was in these moments that I recognized the power of this kind of collaboration. It was incredible for me to hear the lived global perspective from both teachers and students during our lessons. It was a joy to collaborate with the teachers and staff during this time to construct quality lessons together. I left GWA Switzerland knowing we had created a strong connection to our units and a spark of mutual excitement to continue our work together. To ensure our continued contact, I connected the music, humanities, and all PYP classrooms from both schools to each other via email. We have plans to exchange videos in specific classes during the coming weeks. I plan to use the photos, 360-degree images and videos I took during the exchange to help the students and teachers in Chicago immerse themselves in the Swiss experiences I saw firsthand. One such example was my visit to a local déchetterie, or civic waste-reception center, where I witnessed the systems that support recycling in each village. I will be using this footage with our third-graders, who are in the midst of their Environmental Impact unit, and our kindergartners, who are starting their Waste Management unit. I believe that by meeting in person, the teams at Switzerland and Chicago will now be able to create a strong bridge that joins us as a true World Academy network. This kind of collaboration is what sets GEMS apart from other private schools. It’s what makes us uniquely suited to prepare the global leaders of tomorrow.